Before we tell you where to shop some of the best Indian wedding dresses, it's important to understand a bit about how to shop for them in the first place. If you've attended more than one wedding, you'll know nuptials can vary from couple to couple. Whether that's due to cultural, personal or religious differences, every wedding is unique. Some cultures opt for white wedding dresses, for example, while other cultures get a bit more colourful. 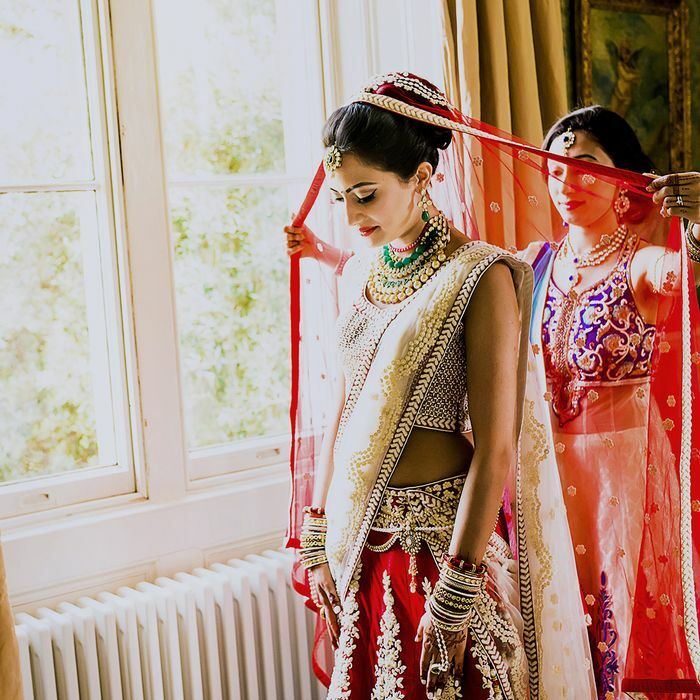 I spoke to Sejal Kapadia Pocha, Flare magazine's social media editor, about her Hindu wedding, and she told me everything you'd ever need to know about shopping for an Indian wedding dress, as well as where to find the best designs. Keep scrolling for more. First up, I wanted to know how many looks you'd wear for an Asian wedding. "It can vary depending on the religion and South Asian region you originate from," says Sejal. "Typically you'd require two evening outfits (one pre-wedding event and one reception), one for the wedding, and perhaps two simpler options for pre-wedding rituals/events at home. So I guess that makes a total of five. I actually had six at mine." Sejal also talked me through the traditional colours. "On their wedding day, Hindu brides usually wear any shade of red, red and white, or red with touches of green. But many brides I know are changing this up by wearing blush pink, dark pink or maroon. Sikh wedding attire is similar to Hindu attire, but Muslim weddings are quite different, so I can't speak for those events." So where do you start looking for Indian wedding dresses? "Most women start looking at their local Indian stores, magazines and Indian designers online for inspiration," says Sejal. "Designers like Sabyasachi and Manish Malhotra are leaders in the wedding-outfit game, with many wholesalers creating copycat designs. Some brides choose to get their main bridal outfits in the country, whether it's a store that imports ready-to-wear outfits from India or a local couture designer. Others decide they'd rather just go to India for a week and get their shopping done there (which is what I did)." When it comes to preparation, Sejal recommends a least a year. "I had a long engagement, so I was planning for about a year and a half, which I felt like I needed. But most of my friends have planned theirs in nine to 12 months. A lot of venues and popular Asian wedding suppliers are booked up to a year in advance during peak times." In terms of shops, there are loads in the UK, including both ready-to-wear and bespoke. "It almost comes down to the shopping experience, quality, variety/choice, trend and price you're looking for (although shopping in India isn't cheap anymore)," advises Sejal. "Just to add, fashion trends in Indian bridalwear and traditional dress in general are forever changing! Brides who are more conscious of this—and who want 'the latest' stuff—seem to go to India." That said, Sejal doesn't recommend any specific shops, but there are areas that many people hit up, including Ealing Road in Wembley, Southall, Green Street and Leicester. "I bought most of my clothes and jewellery from Mumbai, Surat and Gujarat," she reveals. As for accessories for an Indian wedding, according to Sejal, "traditional Asian outfits (not sarees) come with veils you can style in different ways. Only on your wedding day would you wear it on your head." As for jewellery? "At the end of a Hindu wedding, the husband will place a necklace called the Mangalsutra around the bride's neck to symbolise their marriage," Sejal tells me. This is made up of black beads and can be designed in gold or with diamonds. "It's the Hindu equivalent of a wedding band for the woman," she adds. Happily, red is the colour that suits everyone.